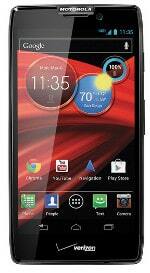 The Motorola Droid Razr Maxx HD was announced in September 2012 and is available exclusively from Verizon in the US. The smartphone has similar specifications to the Droid Razr HD, plus a larger battery allowing for 32 hours of normal use, 13 hours of video playback or 21 hours of talk time. It also features a 4.7-inch 720p screen, 1.5GHz dual-core Snapdragon processor and NFC. The Droid Razr Maxx HD runs Android 4.1 ‘Jelly Bean’. Learn more at Motorola’s Droid Razr Maxx HD page.